One of Jane Austen’s most beloved works, Pride and Prejudice, is vividly brought to life by Academy Award nominee Rosamund Pike (Gone Girl). In her bright and energetic performance of this British classic, she expertly captures Austen’s signature wit and tone. Her attention to detail, her literary background, and her performance in the 2005 feature film version of the novel provide the perfect foundation from which to convey the story of Elizabeth Bennett, her four sisters, and the inimitable Mr. Darcy. Public Domain (P)2015 Audible, Inc. 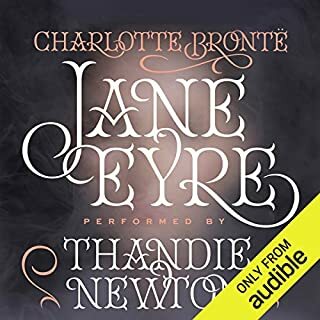 This is the fourth Audible version of P&P that I have purchased and listened to, and the first I have bothered to write a review of because it is by far the best. Rosamund Pike mispronounces a very few words, and sometimes goes overboard in her zeal to create separate, distinctive voices for each character, which sometimes (e.g., with Mr. Bingley's married sister Mrs Hurst) results in a female character sounding like a man), but overall is the most adept of all narrators of this beloved classic at allowing Austen's flawless prose to speak for itself. 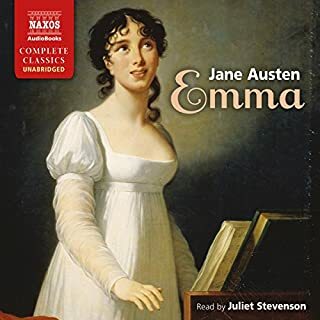 Her reading easily exceeds that of Alison Larkin (the 200th Anniversary Audio Edition), although that one is lively and entertaining, and includes music. 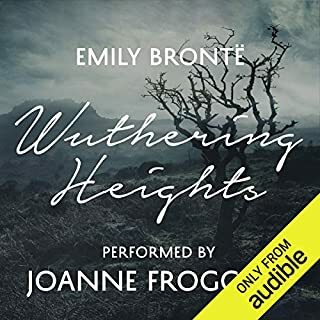 The audio quality is far better than that of the version narrated by Lindsay Duncan, which, combined with Duncan's almost whispered Mrs Bennet voice, often makes that version difficult to listen to while driving. Pike's narration even exceeds that of Carolyn Seymour in the Blackstone Audio version, which until now was the most listenable of all. Bravo, Rosamund Pike! And thank you, Audible! I will listen to this audiobook many, many times in the years to come! 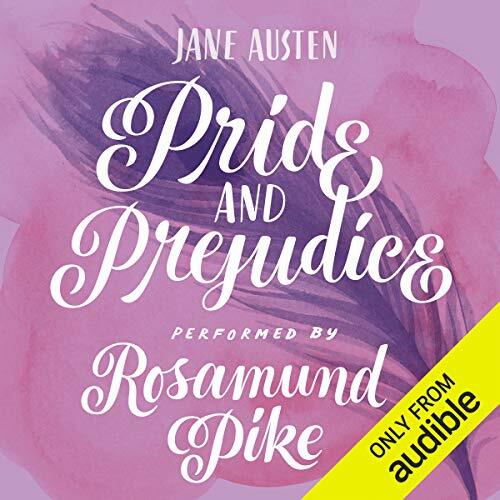 Where does Pride and Prejudice rank among all the audiobooks you’ve listened to so far? This is the second edition of Pride and Prejudice that I purchased - I already have an older version (different narrator) and I am so glad that I saw Rosamund Pike's name and immediately bought this one. It is absolute perfection. It has long been one my favorite books but with her priceless narration if is certainly going to be on of the Beloved ones. Which character – as performed by Rosamund Pike – was your favorite? Practically all of them. She is a brilliant narrator with magnificent voice and managed to make even Mrs Bennet tolerable - not a small feat in itself. Her Mr Bennet is fantastic (actually I think she did it better than Sutherlend's performance in the 2005 movie) - she managed to subtly underline a hint of malevolence in his humor which I personally think is there and most people do not pay attention to. It made me smile in sheer sensual pleasure all the time I listened to it (could not stop and listened through the night). A wonderful audio book, simply wonderful. I hope this is not the last time I listen to something narrated by Rosamund Pike. Rosamund Pike's voice was a great addition to the slew of Pride and Prejudice narrators. While her narrator voice is beautiful, and her main characters voices are lovely, her ancillary character voices are WEIRD. Watch out, Maria Lucas has a lisp. And a strange one at that. At first her voices for these extras was pretty distracting, but I think Pike made up for it with how well she reads the rest of this novel of perfection. Would you listen to Pride and Prejudice again? Why? I would. Its a classic story and enjoyable each and every time. Rosamund Pike just has the most perfect voice to narrate this story! It wasn't - sadly a little too long for one go. Would you consider the audio edition of Pride and Prejudice to be better than the print version? Not better necessarily, but as an American, it certainly adds to the feel of Jane Austen. So, actually, maybe yes, better than the print. Best if read while you listen to it! What about Rosamund Pike’s performance did you like? I mean...the moment she opens her mouth it's like silk. Trying to change my voice for our daughter every time I read a good book gets difficult, and tiring, and sometimes I forget which voice I used for which character. This is one of my favorite books everrrrrr, and so as not to spoil it for our 11-year-old, Rosamund delights the imagination as we read along. No, more like as background, but only because I've seen the movies and read the book repeatedly. Having loved the story since high school lit class, I have read my tattered copy of Pride & Prejudice nearly every year. I have etched out time to indulge in the long A & E movie version and when time eludes, enjoy the latest 2-hour version. Yet I have known that the vocabulary and its rightful owners had to be abridged and reassigned in the screenplays. 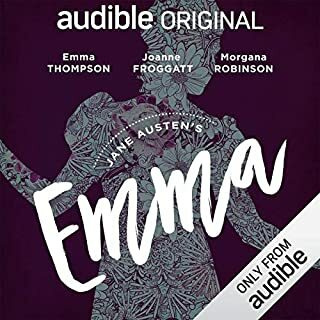 When I saw that Rosamund Pike (actress who portrayed Jane in latest movie) had recorded for Audible, I immediately put the book and a pair of headphones on my wish list. Birthday gifts did not disappoint, and I have cleaned my house top to bottom, folded laundry, sat for a spell, all the while thoroughly enjoying this audio version. Ms Pike's voicings have made me smile and laugh out loud. Her Mr. Collins and Lady Catherine are hilarious. The encounters at Rosings were some of my favorites. What a treat to get the whole story in dramatic form. I feel satisfied and look forward to listening again and again. An exceptional narration of a great novel. If you could sum up Pride and Prejudice in three words, what would they be? Elizabeth Bennet is the story. She gives a lively and nuanced reading, showing a well-known story in a fresh aspect. Yes, but I forced myself to go slower and enjoy the details. I am familiar with P&P, and have the Lindsay Duncan performance, which I like, and had thought was the best available. Now I believe the Rosamund Pike narration is even better, more lively, subtle and interesting. Wonderful reading of a literary classic! Normally I would say no to this question but I absolutely enjoyed this audio book more than my first reading of the book years ago which I loved as well. What does Rosamund Pike bring to the story that you wouldn’t experience if you just read the book? Rosamund gives such depth to the characters through her different inflections and voices. The way she portrayed some of the characters had me smiling from ear to ear. For anyone that loves Pride and Prejudice, I suggest this audio book. I was afraid it might be too slow for a listen but it proved to be just the opposite. I don't think I'll ever enjoy reading it again unless I am listening to Rosamund read it to me. What made the experience of listening to Pride and Prejudice the most enjoyable? Rosamund Pikes's voice acting is neither shrill nor muttled. She speaks clearly and enjoyably while changing her voice to represent all my favorite characters. Well done. Good, but too many "voices"
This is one of my favorite novels and I thought the narration was generally good, although I wished the variation in character voices wasn't quite so overwrought. One of my all time favourite books beautifully read. If you love this book I don't think you'll be disappointed. Loved Rosamund's narration - there are so many versions of this book in film and actors, but I truly enjoyed how she'd done it. I hope she will do many more books - especially, perhapd, classics? Rosamund makes this even more wonderful! Pride and Prejudice will always be my favorite book of them all. I have read it so many times and now listened to it for the first..because when I saw Rosamund's name, I just had to buy it. And I was not disappointed. Her voice were amazing, I extremely loved her portrayal of the ever annoying Mrs. Bennett. Jane Austen's words and Rosamund's voice equals perfection. A really wonderful listen that I didn't want to end. I adore this story and so was always going to be somewhat biased when listening, especially with Rosamund Pike being the reader. She who played Jane Bennett in the film adaptation. My hopes were not at all disappointed and this really is such a wonderful reading of a great story. Really so very enjoyable and I highly recommend it to anyone. Definitely something I shall be coming back to again and again. Anyone who loves the classics in audio book needs to know about Whispersync regardless of if you choose to use it or not. The reason for this is that Audible usually gives a drastically reduced price for people who have the kindle edition of a book and since the majority of the classics are free on kindle, books like Pride and Prejudice and hopefully David Copperfield when it's brought out, become incredibly cheap when they are made Whispersync. So if you haven't already, I'd suggest going to Amazon and 'buying' the free edition of Pride and Prejudice, then seeing the price difference on here before you choose to spend your credit on it. Just perfect, I couldn't believe how good Rosamund Pike's voice acting talents are, I knew she'd be brilliant at the women but to manage to do such a good job with all the different ranges of the men too was really something. **spoiler**As for that ballroom scene where every single member of her family embarrasses Elisabeth apart from Jane, I've never felt the need to cringe like that when reading the book or watching the series. Pike brings the whole thing to life pulling no punches, even in her portrayal of Mr Bennett, who though much beloved by his daughters and usually seen through rose tinted glasses, does hold a large amount of blame for the difficulties that befall his daughters in the book. I'd not read Pride and Prejudice before though I knew the story but I've found I like listening to the classics. Rosamund Pike added a whole new dimension to this story; if I didn't know any better I'd have thought there was more than one narrator. I really enjoyed the storyline, more than I was expecting to. Definitely worth a listen. Pike performed wonderfully, such a pleasure to listen to! Only Mrs Bennet was slightly irritating vocally...otherwise - flawless! I bought this version of Pride and Prejudice because of the fabulous reviews about Rosamund Pike’s narration and, goodness, was I wrong to do this. Her performance was almost comical for the voices portraying men and the voice she came up with for Mrs Bennet bordered on something you might hear a child performing at the local school play. I don’t want to be this insulting about Ms Pike but I feel like I’ve been misled into buying a version of this book that I find irritating to listen to. The language is so beautiful and it needs to be delivered as naturally as possible in a clear and precise manner. Ms Pike stumbles awkwardly over the words for the male characters and seems to run out of breath during many of the speeches eventually mumbling into an incoherent hum. I really don’t know why there are so many rave reviews about her performance but don’t buy this version is you want a decent delivery. Having as little affection for high society as I do, I was always reticent to read this book. I find that I now detest myself for enjoying it so much and I believe I judged it unfairly. The tête-à-tête between the two main characters was enthralling and laced with double meaning. On a more simplistic note I learned about half a dozen new words. Jane Austen's critique of high society and its trappings was piercing and I should have given her more credit. in addition, Rosamund Pike's narration was exceptional. Beautifully narrated which did justice to the classic wit and brilliance of Austen's celebrated work. What was one of the most memorable moments of Pride and Prejudice? As much as it is not enjoyable for Lizzie, I do love to hear about the shenanigans of her family at the Netherfield ball or in town. Which character – as performed by Rosamund Pike – was your favourite? It was her captivating eyes! Fun story enhanced by Narrator! We had a long (10 hour) car drive, and the audio book was a perfect way for my daughter to complete her prescribed school book on the way (she gets car-sick reading). I love the story too, and we enjoyed listening together! 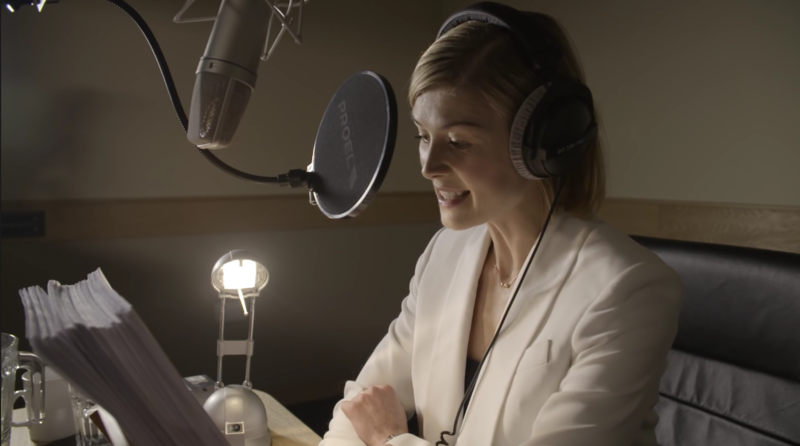 We found both the speed of Rosamund Pike's narration and her character voices just right. I think any slower would have made the language too laborious for us. I have found that audio books are a great way for teenagers to tackle the classics that are often set for school. The language can sometimes be cumbersome for them to read, but the audio format is more accessible, and they can go back to the text more easily once they have heard the book. Highly recommend it - we're doing The Great Gatsby next! 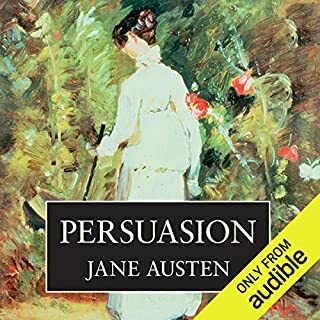 I thoroughly enjoyed Rosamund's reading of this story and through this audiobook, Pride and Prejudice has become my most beloved story! Rosamund did such a fantastic job that I really, really wish that she would read aloud more of Jane Austen's works in the very near future! Excellent narration. Over rated story. I don't know why this was so popular in the modern age. Great vocabulary but the story alot of words leading up to nothing. This is a great book, undoubtedly. Jane Austen had a good sense of humour. As an audio book, it's really good. As I was listening Rosamund Pike, I felt like I heard the voices of the movie version. There were just a very few characters whose voices weren't the best. I highly recommend this audio book. If you already know the story, it's the narration that counts, and unfortunately this rendition is a let down! The reading feels quite rushed. No life in the characters, particlarly Mrs Bennet. I noted it does get a bit better as the narration goes on, and Rosamund does start to breathe a bit more life into the varying voices, but still not enough to redeem it. A lovely story as we know. The narrative of this book was impeccable. She drew me into the world and people of back then.